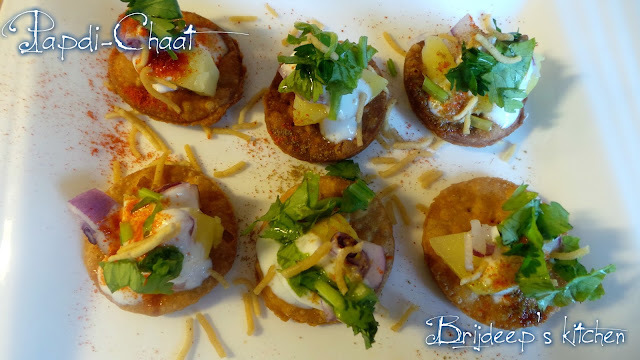 I have to admit that I love love love this chaat of all the chaats shared before, and even those I have had in my life. 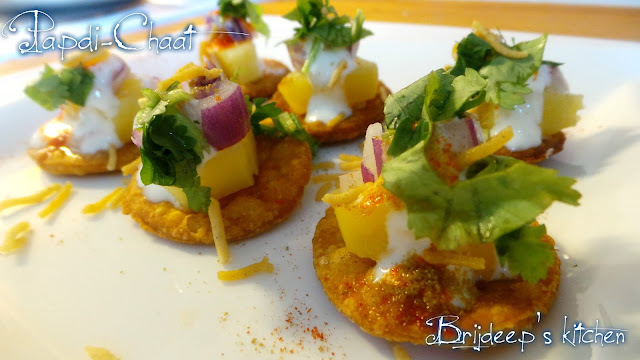 This is one chaat I used to enjoy much at the street vendors in India. But this has stopped ever since I moved out of India and I have been ever since craving for this chaat (and all my others which I enjoyed eating at roadside stalls). 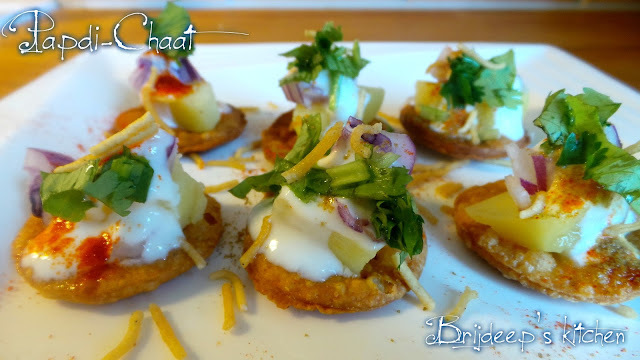 So I thought of making papdi chaat at home if I can't have it outside. First I thought what else can I do, but quickly realized that it's much better, safer, economical and hygienic as we have no idea what's there in the chaat made at road sides. Even so, I made the papdi at home (and that too from whole wheat flour instead of maida) so everything is from scratch and I know what am I eating. Now I feel it's much easier to have the chaat in the comfort of our own home. All you need to fry enough papdis once and store them in air tight containers. They keep over the shelf for a long time. Onion (chopped finely) You can use the small white onions if the pink are too strong. Begin by laying the papdis on a flat tray or a serving plate. Add the peeled and finely diced boiled potatoes to the papdis. Also add finely chopped onions and green chillis. Now sprinkle the dry spices according to flavor: salt, red chili, cumin powder, mint powder and mango powder. Add the green chutney over all the papdis. Add tamarind chutney also if required (I did not use tamarind chutney). Now pour the beaten yogurt over all of this. Or you can pour a little yogurt over each papdi and leave more beaten yogurt in a big bowl while serving so everyone can pour yogurt according to their own requirement and taste. Now garnish with coriander leaves and finally sprinkle the fine (or coarse) sev over the whole chaat and serve directly. 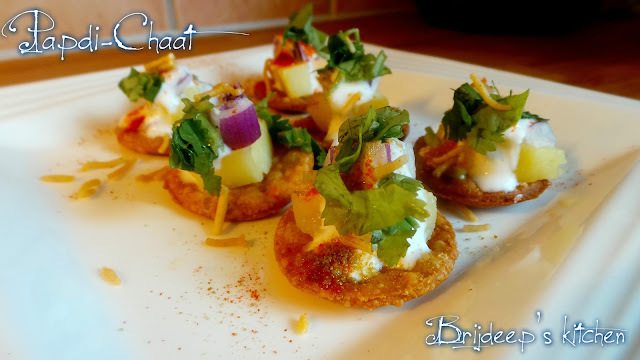 Do not make the chaat and serve later as the papdis will become soggy. If you need to serve later, prepare everything and keep aside, assemble and serve directly. 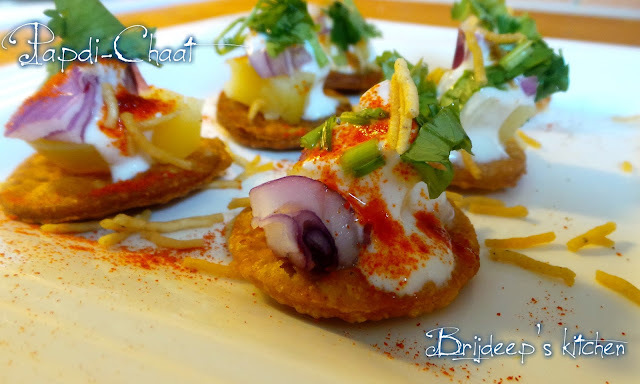 I feel the best way to serve this chaat is by having beaten yogurt, green chutney, tamarind chutney and extra sev in separate bowls along with the chaat served so everyone can adjust all these flavors according to the taste. Enjoy ! !